Our series on NBA uniforms, inspired by last week’s #HickoryPacers revelation, concludes today with a post containing a qualifier. The Boston Celtics, Los Angeles Lakers, and New York Knicks — three franchises that began in the 1940s (the Celtics and Knicks are originals from 1946; the Lakers soon followed in 1948) — have the three best uniforms in the NBA. You’re not going to get much, if any, debate on that particular point. There’s no need to roll out a “best-of” uniforms list with those three, because they’ve always set the gold standard. What’s better and more helpful in this ongoing discussion of uniforms is to show that comparatively younger organizations — those with fewer accomplishments and a less entrenched place in the popular imagination — nevertheless managed to create attractive new uniforms at a given point in time. Just because you’re new (or newer), you don’t have to create a loud and off-putting uniform such as the ones profiled in this piece from Friday. What’s particularly revealing about most of these organizations is that they arrived at the right uniform in their second attempts at worst; only one franchise on this list needed a third chance to create its ideal and best-remembered uniform. * None of these franchises were founded before 1963, and one of them relocated in 1973, when it reinvented itself and devised its best uniform. * None of these franchises have won more than one NBA title. That they still left an indelible mark on the public with their threads speaks volumes about the quality of these uniforms. The abundance of orange might be a bit loud, but the Cavaliers’ second uniform is a vintage 1980s uniform in that it is simple and uncluttered. The color might be a bit too piercing, but the lack of other distractions enables it to “settle” a little bit. The “V” in CAVS creating a ball-and-bucket image remains clever, roughly a third of a century later. This uniform is stylish without overpowering the eye of the beholder. 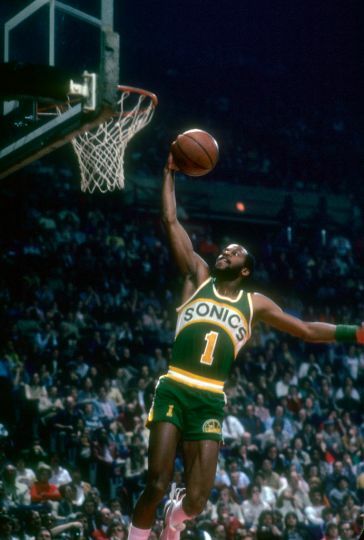 Ricky Pierce’s jump-shooting motion was gorgeous, but his uniform did not hurt the look of this picture, taken inside the wonderfully quirky arena, The Mecca. Notice how the Bucks’ white home uniform fits right in with the classic Philadelphia 76er road uniform. The Sixers’ uniforms from this era are also among the best the NBA has created; they reside in “Celtic-Laker-Knick” territory. 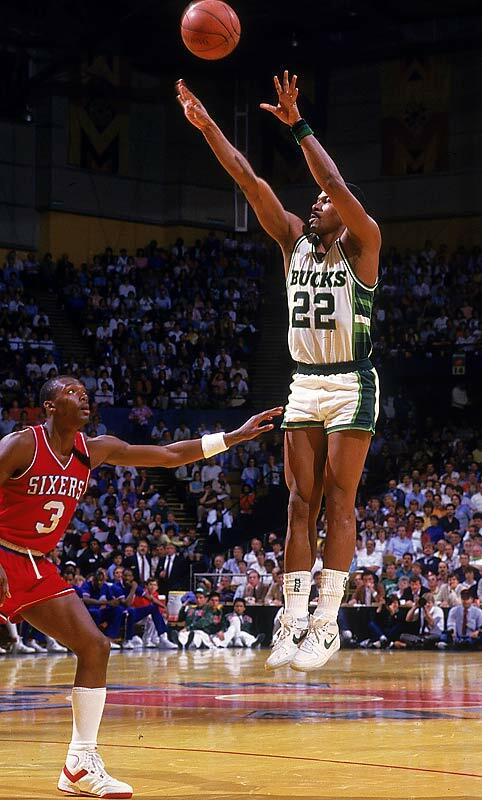 That the Bucks’ home uniform of the time holds up so well against the Sixers’ threads is a powerful indication of its quality. 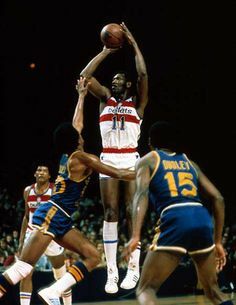 Stripes or ribbons of color don’t naturally create great uniforms, but the red-white-and-blue look of the Bullets’ uniforms — as soon as they arrived in Washington, D.C., from Baltimore — was snappy. 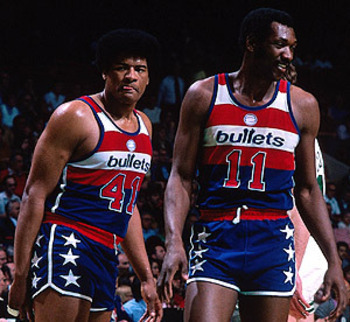 It has remained so, and the Wizards have brought that look back to cheers from lovers of NBA uniforms. The horizontal stripes on the Bullets’ uniforms set off the word “Bullets” in a way that was clear and clean, but without being jarring. These uniforms broke a number of rules, and for that, they deserve a unique place in the annals of memorably good uniforms. 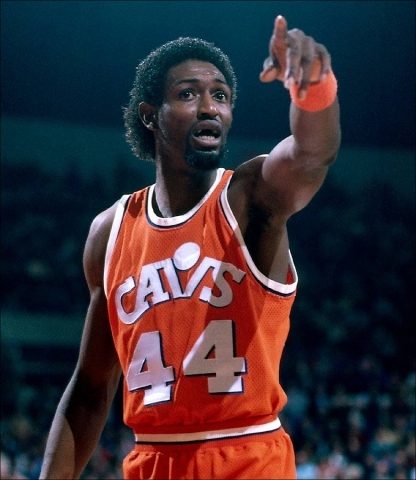 The pervasive green on this road uniform puts it in line with many other uniforms that were created at the time, such as the all-orange Cavs uniform in spot No. 5. It might be too much of one color, but it’s the color of the lush and green Pacific Northwest. 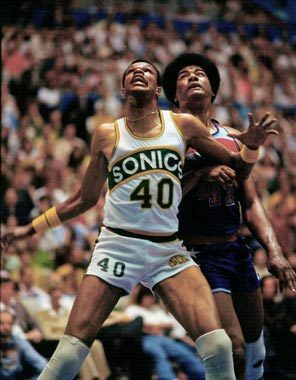 Like the Atlanta Hawks’ acclaimed 1980s uniforms, the Supersonics adopted the horizontal band higher up on the jersey with the team name across the front. It was a dark day in Seattle when the Sonics abandoned this look in the mid-1990s. 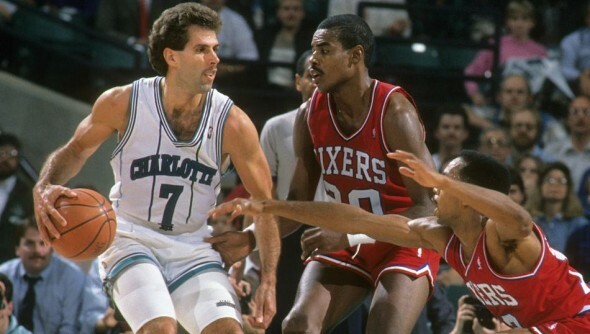 This was the first uniform the Hornets devised. It remains their best. Recall that in our 10 worst NBA uniforms piece, linked to above, we noted that Orlando’s 1990 uniforms featured thick stripes. Good striped uniforms generally feature thin stripes, and as you can see, the Hornets got it right in their opening season. As was the case with the Bucks above, this uniform belongs in the same picture with 1980s 76er road uniforms. It does not look like an inferior product.